Of all the Ulster militia units the South Down can claim two special distinctions: the only one awarded a battle honour and the only one with a ballad dedicated to its ‘soldierly’ qualities. The unit came into existence in 1800, following the amalgamation of the Drogheda Battalion, the 24th, with the 5th Louth Regiment which left a ‘vacancy’ on the Militia roll. Since the 8th Royal Down Regiment had twelve companies, it was divided into two six-company battalions as the 8th Royal South Down and 24th Royal North Down. The original Down Regiment, also known as the Royal Downshire Regiment, whose Colonel was Lord Downshire, received Colours at Youghal in May 1794. Described as ‘truly superb’, his Lordship paid £70 10s. 0d. (£70.50) for the Colours at a time when Militia regiments in England were allowed £18 10s.0d every twelve years to pay for Colours. 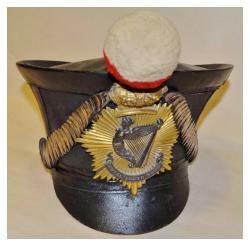 It may be seen that Downshire was determined to make his regiment quite distinctive. As with the other Irish Militia units the Downs were mobilised as soon as the regiment was formed in 1793 and are recorded as having been embodied ‘almost continuously’ from 31 August 1793 to 10 October 1814 for the Revolutionary and Napoleonic Wars. There followed a further short period of embodiment. In the 1798 Rebellion the Royal Down Regiment was engaged in actions at Coolbawn and Castlecomer in County Kilkenny on 23 June, followed by Kilconnell Hill three days later. These actions brought the Downshires into battle against rebels led by one of the most famous of rebel leaders, Father John Murphy, whose men had advanced to Goresbridge through the Scullogue Gap in the Blackstairs Mountains on the 22nd. 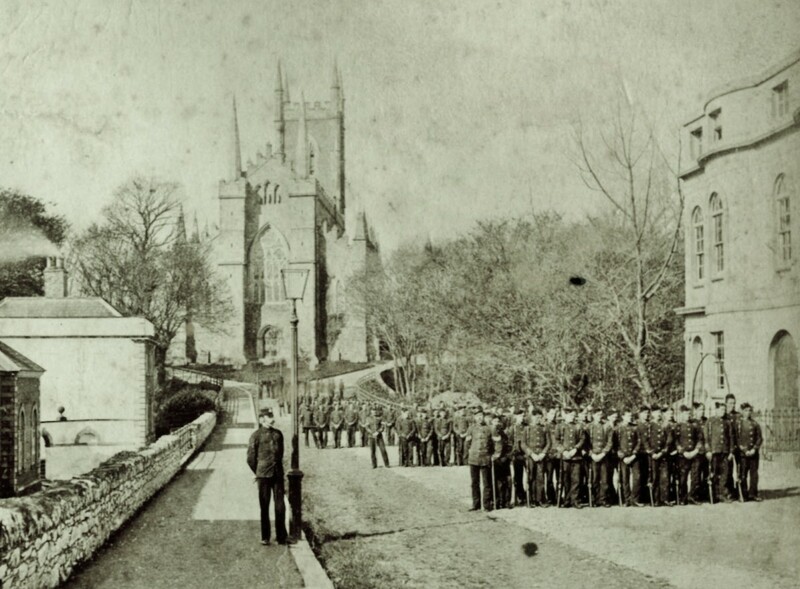 Next day a company from each of the Wexford Militia and the Royal Down Militia arrived at Castlecomer to reinforce the troops already there, who then moved out to meet the rebels at Gurteen. The resultant clash was a triumph for the rebels who sent the government troops retreating to Castlecomer. However, once there, discipline was restored and two buildings beside the bridge were taken over as strongpoints from where all rebel efforts to advance were rebuffed. Although the rebels demanded the surrender of the Militia, the arrival of substantial reinforcements deprived them of any advantage and they withdrew towards Wexford. On their retreat the rebels, some 5,000 strong, chose to camp for the night near Goresbridge. Their camp was on Kilconnell Hill, also known as Kilcumney or Kilcomery Hill. Under cover of thick mist early the next morning the rebel camp was attacked by a Militia force of 1,600 men, 1,200 commanded by General Sir Charles Asgill, and 400 of the Down Regiment commanded by Major George Matthews. The rebels were forced to flee but Asgill refused to co-operate with Matthews in mounting a pincer operation that could have resulted in a clearer victory. Nonetheless, Matthews pursued the rebels for 20 miles towards the Wicklow Mountains. The Downshires marched for 39 hours through three counties, Queen's (Laois), Kilkenny and Carlow, harrying the rebels. A further suggestion to Asgill from Matthews for a co-ordinated operation bore fruit and the resulting fresh attack led to the rebels’ defeat. Throughout, Major Matthews had shown more initiative than did General Asgill, who seems to have been intimidated by the rebels’ greater numbers. In September 1798 some 300 of the Downshire Regiment were operating as part of General Trench’s Column against Humbert’s French invading force in the Killala area where, on the 26th, it was reported that the rebels had lost between 500 and 600 men. The Royal Down Regiment was split into the Royal South Down and Royal North Down Battalions in 1800 and continued on active service until the end of the French Revolutionary War. However, both battalions were recalled to service in 1802, remaining so almost continuously until 1816 and the final defeat of Napoleon. Both provided recruits for the Regular Army throughout that period but were reduced to cadre strength in March 1816. In addition, the South Downs volunteered for service in England and were stationed there in 1813 and 1814. In the re-organisation of the Militia across the UK in 1833 the Royal South Down Militia became the 112th Militia Regiment. On 30 July 1845 a later Lord Downshire was appointed Colonel with Lord A Edwin Hill becoming Lieutenant Colonel on the same day. Among their officers were some whose commissions dated back to the period of mobilisation in the first two decades of the century. Charles Birch, the Paymaster, had been appointed on 19 November 1807 while Lieutenant Alexander Montgomery held a commission dated 11 November 1808. Captains Marcus Annesley and Thomas John Tighe, as well as Lieutenant Edward F Noland held commissions dated from 1812. Regimental headquarters was at Hillsborough. The Royal South Down Militia was embodied for the Crimean War between 4 January 1855 and 4 August 1856 and for the Indian Mutiny between 21 September 1857 and 18 May 1858. In 1857 the regiment was restyled the Royal South Down Light Infantry but with the Childers Reforms of 1881 became the 5th Battalion of the Royal Irish Rifles, formed by the amalgamation of the 83rd (County of Dublin) and 86th (Royal County Down) Regiments. 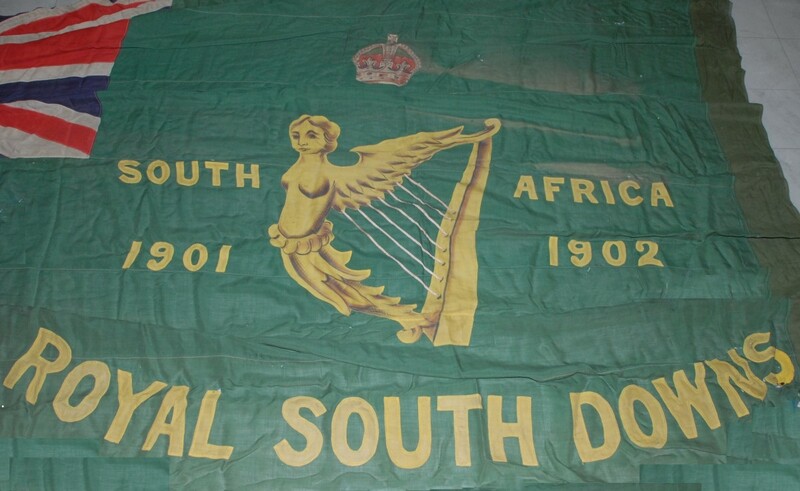 It seems that the regiment’s original precedence as the 8th on the Irish Militia Roll was ignored as the Royal North Downs, the one-time 24th, became the 3rd Battalion Royal Irish Rifles. When the Second South African, or Boer, War broke out in 1899, the struggle against the Boers proved to be a major test for the Regular Army and it became necessary to reinforce the troops sent to South Africa with units from the Dominions and reserve forces from the UK. Among the latter was the 5th Royal Irish Rifles, the former South Down Militia. Eleven officers and 424 other ranks (ORs) of the battalion volunteered for service in South Africa, together with four officers and 110 ORs of the 3rd Battalion and three officers and 107 ORs of the 4th Battalion. The composite battalion, commanded by the CO of the 5th Battalion, Colonel R.H. Wallace, arrived in Cape Town on 28 April 1901. By then the war had moved into a new phase with the Boers adopting a policy of guerrilla warfare, striking at targets such as railways, storage depots, telegraphs and military columns. To counter the Boers’ small commando groups, which operated in their home areas where they could expect support, a scorched-earth policy was implemented. Boer farms were destroyed and civilians concentrated into camps while lines of blockhouses, or strongpoints, were created, radiating out from the main towns and linked by barbed-wire fences. In total, about 8,000 blockhouses were built. Each blockhouse was manned by six to eight soldiers and they proved their value as not a single vital point defended by a blockhouse was destroyed by the Boers. The role assigned to 5th Royal Irish Rifles was to man such blockhouses, although initially they had mounted patrols to counter Boer operations. 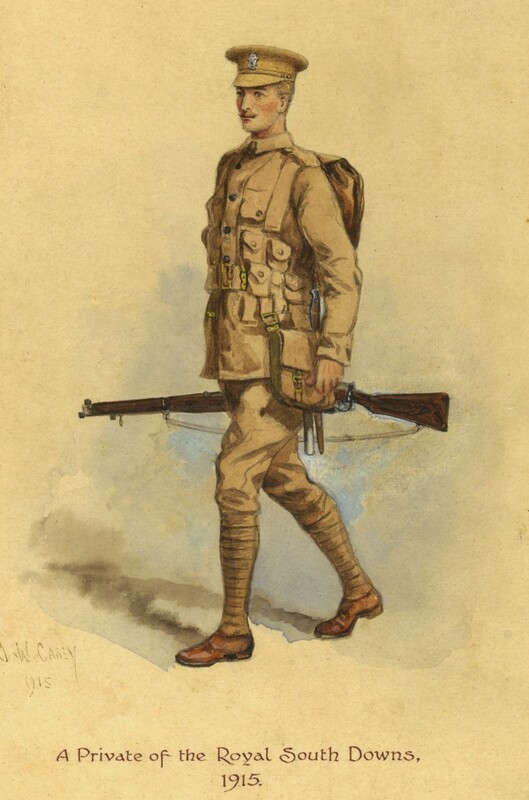 On 17 May one such patrol fought off a Boer commando of 100 men for 45 minutes until the Rifles’ ammunition was exhausted and three men had been killed or wounded severely. Six Boers had been killed and five wounded. The patrol was then forced to surrender but was mentioned by the GOC in District Orders and Corporal Heron was promoted to sergeant. On the same night another Rifles’ patrol prevented the blowing up of a railway line. Thereafter the Rifles took over some of the newly-built blockhouses. Although blockhouses manned by the Rifles came under frequent and often heavy attack, none was ever taken and in only one instance did a Boer party infiltrate past the Rifles under cover of darkness. There were several successes for the Rifles, including the capture of 168 remount horses for Kemp’s Commando, and the battalion was congratulated by senior officers for its service. There were casualties with 33 officers and ORs killed or dying from disease while six officers and ORs were Mentioned in Despatches; these included Colonel Wallace, who was also appointed CB, while Captain C.G. Cole-Hamilton received the DSO and Sergeant Major Gardiner and Private Anderson were awarded the DCM, second only to the VC as a gallantry award for other ranks. The battalion received the battle honour South Africa, 1901-02. Mobilisation for South Africa began on 10 May 1900 and lasted until 24 July 1902. In 1908 the Haldane reforms created the Territorial Force in Great Britain, but the legislation was not extended to Ireland where the Militia was renamed the Special Reserve. Elsewhere in the UK the Militia ceased to exist, except for some small elements, also known as the Special Reserve. The former South Downs became the 5th (Special Reserve) Battalion Royal Irish Rifles. When war broke out in August 1914 the 5th Special Reserve Battalion was given the task of recruiting and training drafts, ‘holding’ men unfit for front-line service, holding officers too young for such service and helping guard Ireland against possible invasion. The battalion discharged this duty with its traditional professionalism and when the war ended was again reduced to cadre. It became only a title in the Army List which remained until its disappearance in 1953 with the final disbandment of the Militia. However, the ballad ‘The South Down Militia’ ensured that it would be remembered long after disbandment.